A huge milestone at the Phoenix Convention Center arrived last week in the form of a petite veterinarian from Colorado. Dr. Monique Weldon, owner of Loving Family Animal Hospital in Aurora, Colo., was the one millionth delegate to visit the Phoenix Convention Center since it emerged four years ago from a $600 million expansion. Weldon, a veterinary professional in town for the American Animal Hospital Association (AAHA) annual conference, was honored by Phoenix Mayor Greg Stanton and City Manager David Cavazos in the convention center’s palatial North Ballroom during the AAHA’s May 14 opening general session. Phoenix Convention Center Director Debbie Cotton and Greater Phoenix Convention & Visitors Bureau President Steve Moore also participated in the celebration. “One million delegates is a testament to the drawing power of our city, our airport, our remade downtown, and this beautiful convention center,” Mayor Stanton said. Cavazos pointed out that one million convention delegates visiting downtown Phoenix equates to nearly $1.5 billion in estimated spending for Phoenix’s economy. The Phoenix Convention Center welcomed its first convention attendees in January 2009. With a glass-and-stone design inspired by the turquoise waters and red rock of the Grand Canyon, the convention center boasts nearly 900,000 square feet of exhibition and meeting space. 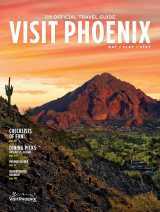 • Every major hotel in downtown Phoenix is either completely new or has undergone multimillion-dollar renovations. • CityScape was built, adding 2 blocks of new dining and entertainment options within a short stroll of the convention center’s doors. On a more whimsical note, in the four years since expansion was completed, the convention center’s catering staff has served nearly 400,000 chicken breasts and 68,000 gallons of Starbucks coffee. In addition to honoring Dr. Weldon with an array of gifts that included a return visit to Phoenix, representatives from the Greater Phoenix Convention & Visitors Bureau and three downtown hotels—the Hyatt Regency Phoenix, Renaissance Phoenix Downtown and Sheraton Phoenix Downtown—donated $1,000 to the Phoenix branch of AAHA’s charity of choice, the Rescue Operation for the Animals of the Reservation (ROAR). The AAHA matched that donation to ROAR, and another $2,500 was given to the group’s cause by BlogPaws, a collection of bloggers who write about pet-care information. ROAR is a nonprofit that provides food, shelter and medical care to dogs and cats rescued from American Indian reservations. According to the organization’s website, extreme poverty and limited access to medical care lead to tens of thousands of animals being orphaned on Indian reservations each year; there are at least 1,500 stray dogs and cats roaming the Navajo Nation alone. On hand Thursday to help ROAR accept the donations was Lucy, a German Shepherd mix who was found in a roadside cardboard box in a New Mexico pueblo. Lucy now lives in a mountainside home in South Phoenix, where she enjoys daily walks and swims in a backyard pool.